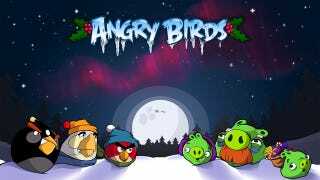 Angry Birds Halloween has morphed to a new holidays-themed offering - Angry Birds Seasons - whose latest pack unlocks a new level every day until Christmas, Advent-calendar style. Seasons, which includes the original Angry Birds Halloween and its 45 levels, is still a buck for the iPhone and free (but ad-supported) on the Android. The latest pack, "Seasons Greedings" gives you a new level each day until Christmas. There are indications this will be the new season/holiday vehicle for Rovio's franchise, so expect more extensions as the calendar turns.